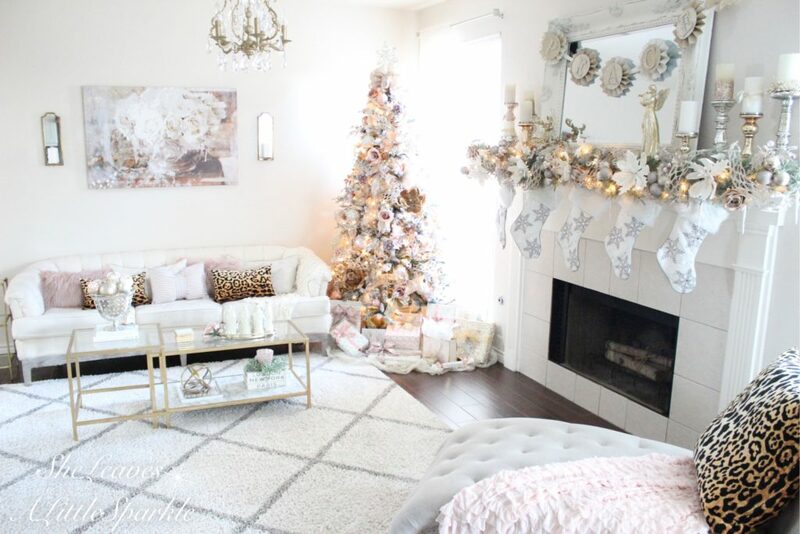 Welcome to our Bloggers Holiday Living Room Tour! Thank you so much to Sandra at The Rustic Life for putting this together. Whether this is your first time visiting my blog or if you’re a regular reader, I’m so thrilled you’re here today! 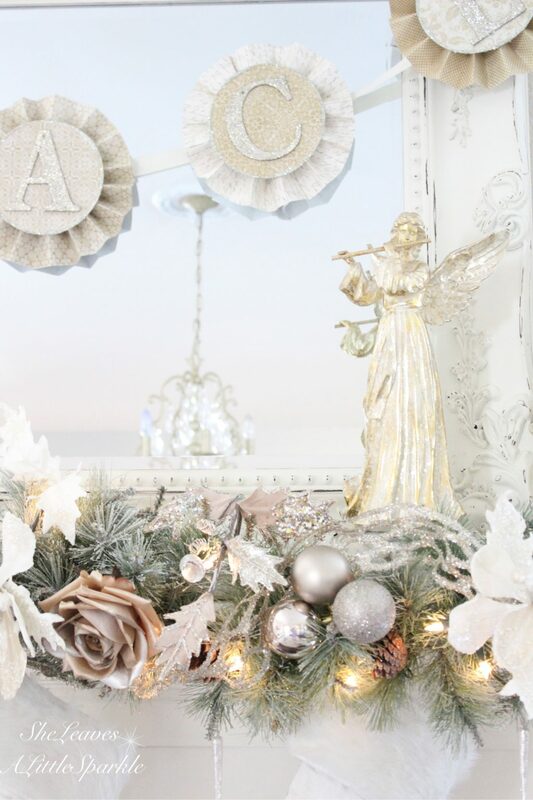 We have all been DYING to share our Christmas decor with you. 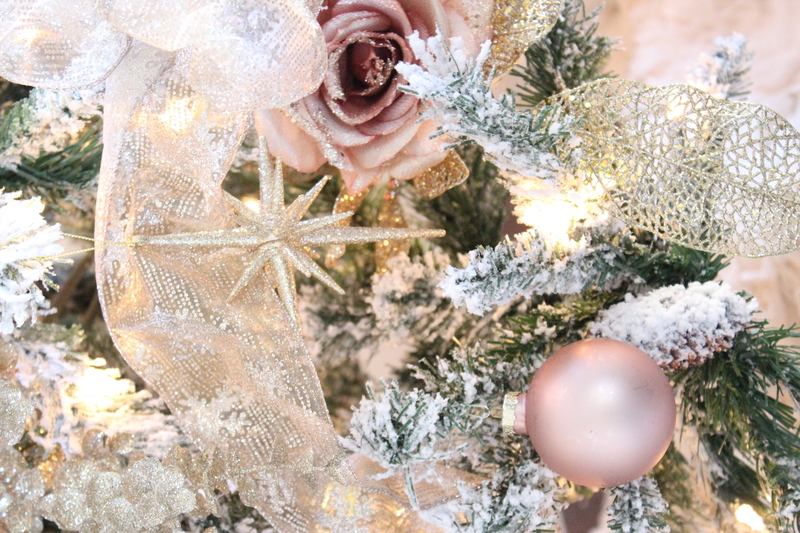 Today I invite you into my Living Room where I did something fun and different this year. This room has been my sitting room and is located off my kitchen, unlike my family room. So it’s a little more feminine. I like to sit on my chaise lounge and catch up on TV while dinner is cooking and get some blogging done. 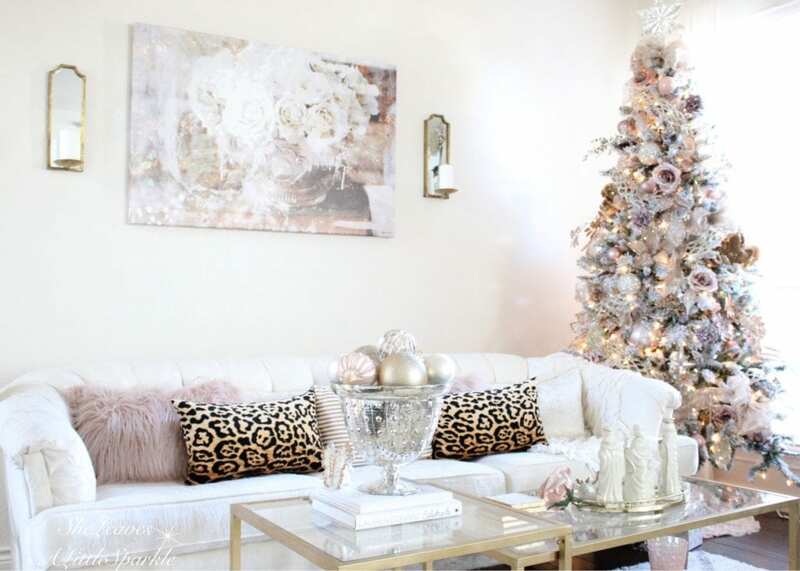 I decided to use all ivory and then add hints of blush with a dash of leopard. The leopard complimented my Oliver Gal Art called “Serving Roses” that had a lot of warm tones of bronze and gold in it. This inspired my tree. 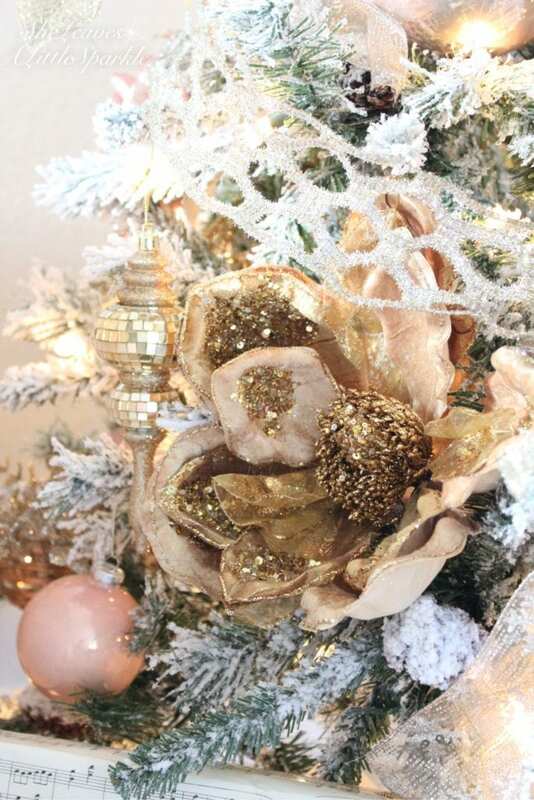 I knew I wanted a flocked tree with blush but as soon as I saw these large, gold, beaded, sparkly magnolia stems at Decorator’s Christmas Warehouse here in Arlington, Texas…. I just knew I was keeping the leopard through Christmas because those flowers complimented the pillows and art as well. It was a match made in heaven! 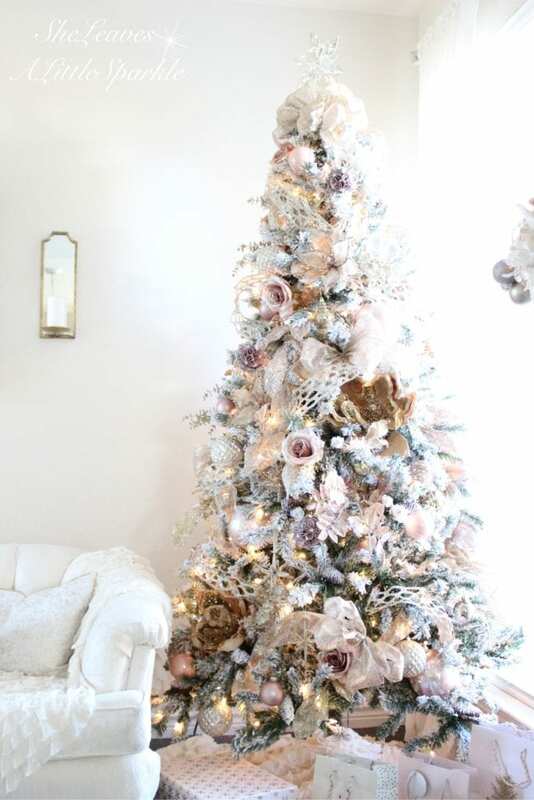 This tree is just a flocked tree I found at Walmart. It’s a decent tree and fine for the little I paid for it but it is NOTHING like the tree I’m sharing in my next Christmas Tour on December 2nd. You DON’T want to miss that! 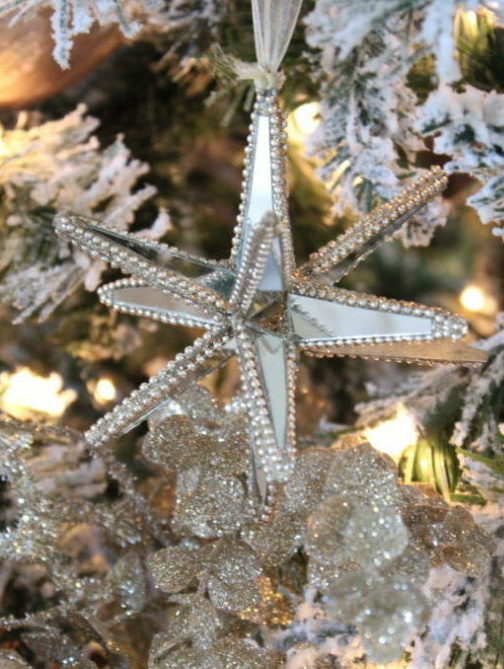 I found this new tree-topper recently that looks like a mercury glass “Star of Bethlehem”. Of course, it needed a huge bow below it on the front and back of the tree. 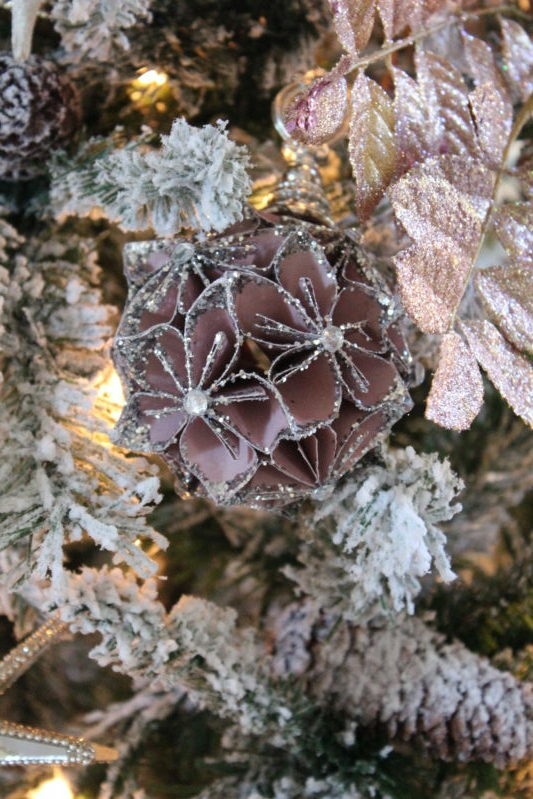 This tree continues down with lots of expandable sparkly ribbon I found at Michaels. 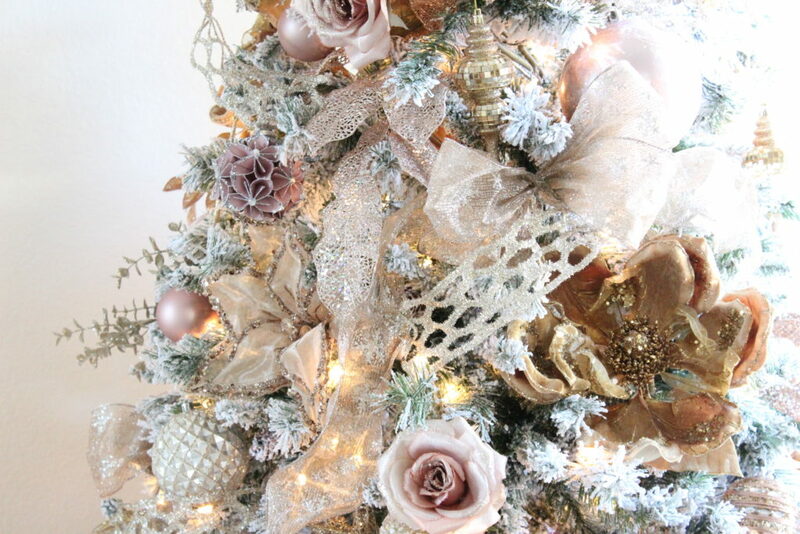 It is the perfect “champagne” color, a mixture of gold and silver tinsel. 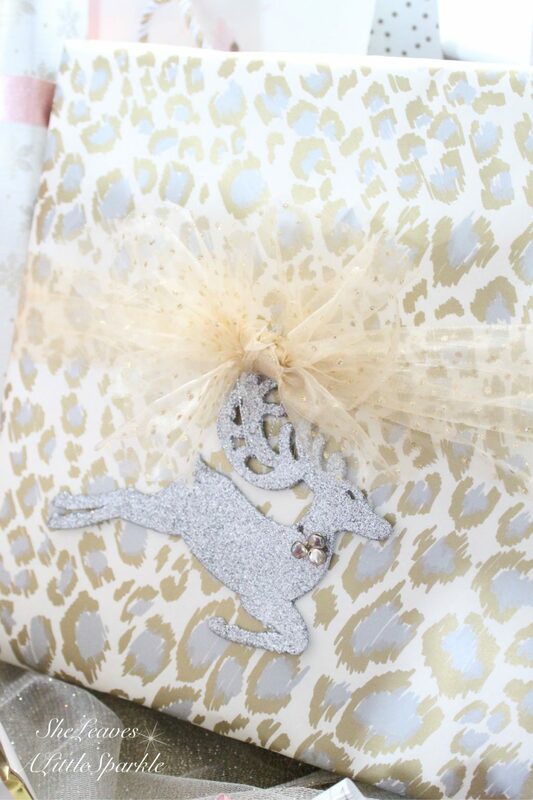 I also found some sheer, sparkly ribbon at the Decorators Warehouse and created huge bows and stuffed them in between branches. I love the way it glimmers as the light bounces off of it. 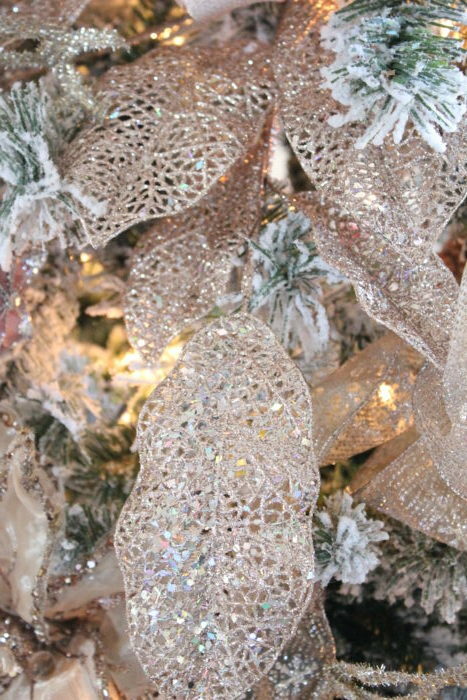 as well and these gorgeous champagne-colored sheer poinsettia stems. They helped balance the rich gold and the soft blush. The pretty blush roses were stems I found at Michael’s this year and they had soooo many gorgeous blush stems and flowers. They even had these glittery blush leaf stems. If you look closely, you’ll see I bought the matching gold leaf stems also. They were a beautiful filler on my tree. I filled my tree with all different gorgeous ornaments from World Market, Michaels, Hobby Lobby, Decorators Warehouse, At Home, and Tuesday Morning. 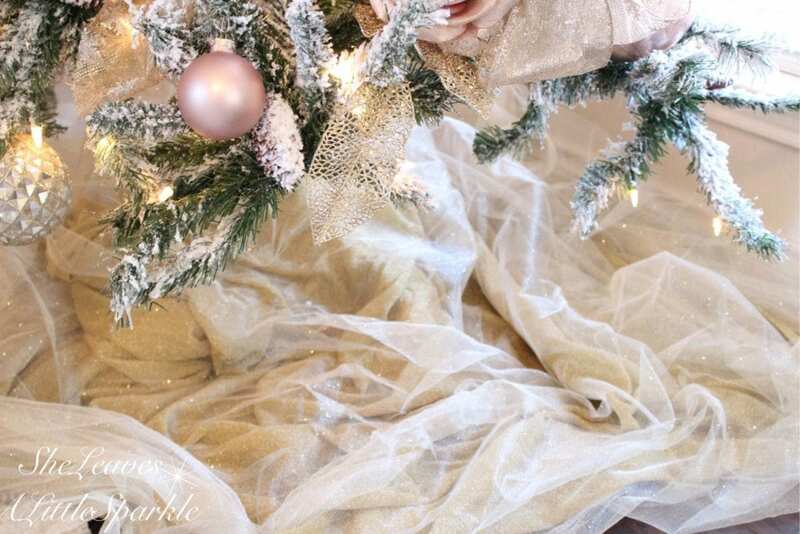 Instead of buying a tree skirt this year, I grabbed some of my shiny gold material from my craft room “stash” and also some some sparkly gold tulle I had as well. I layered it beautifully on top of each other to create a tree skirt. Can you see all of the sparkle? It’s even prettier in person. 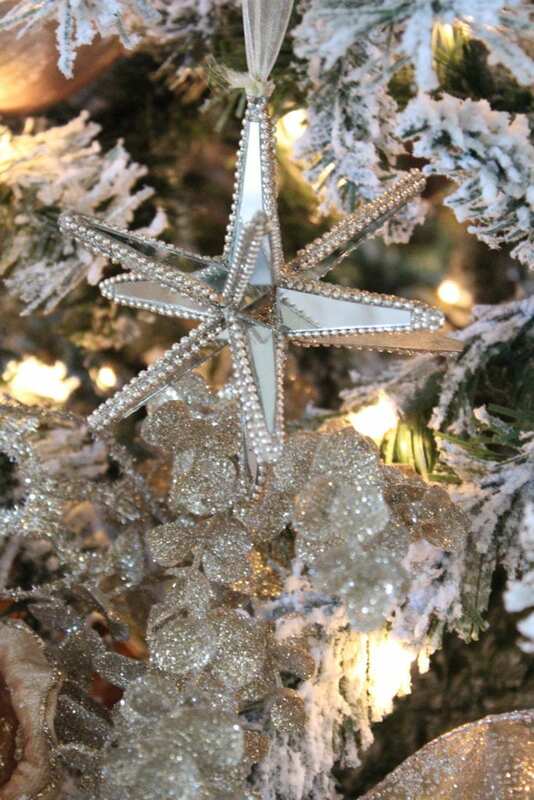 You know how I just love sparkle! 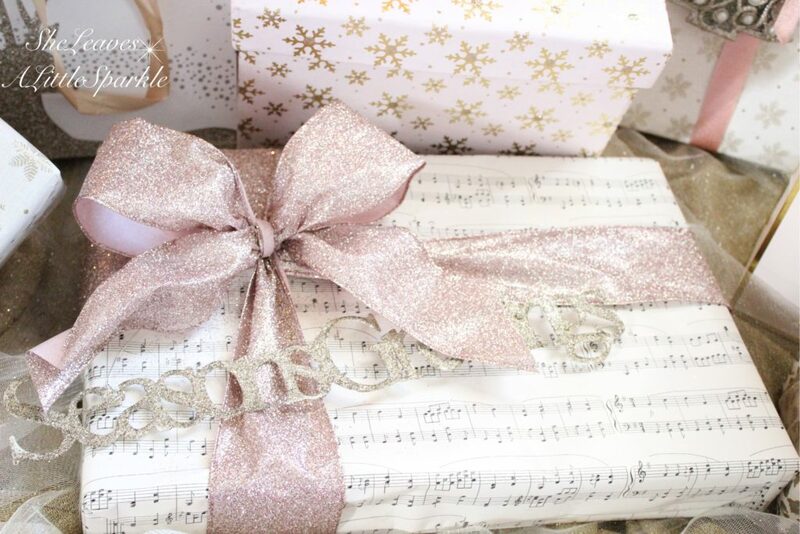 I love this sparkly, blush glitter ribbon from Michaels this year. 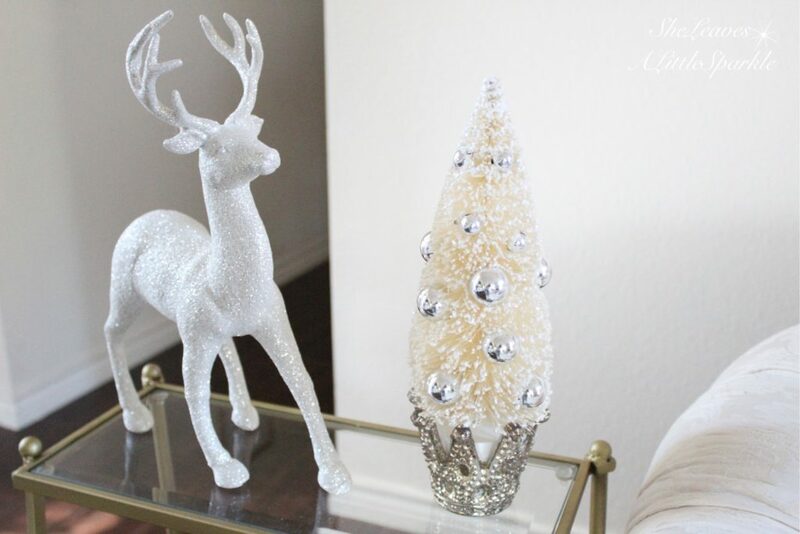 Don’t be afraid to run to the local dollar store and grab some sparkly ornaments to tie on your gifts. They make such a huge difference. You don’t have to make traditional bows. 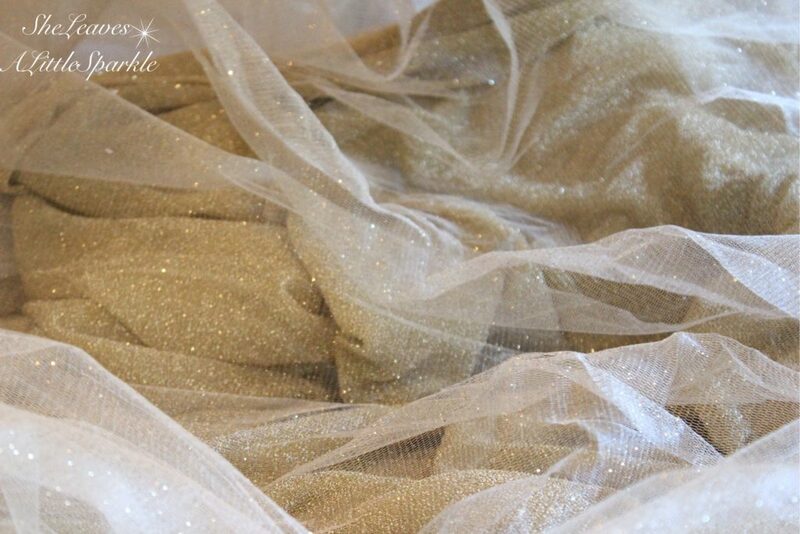 Have fun with some tulle! 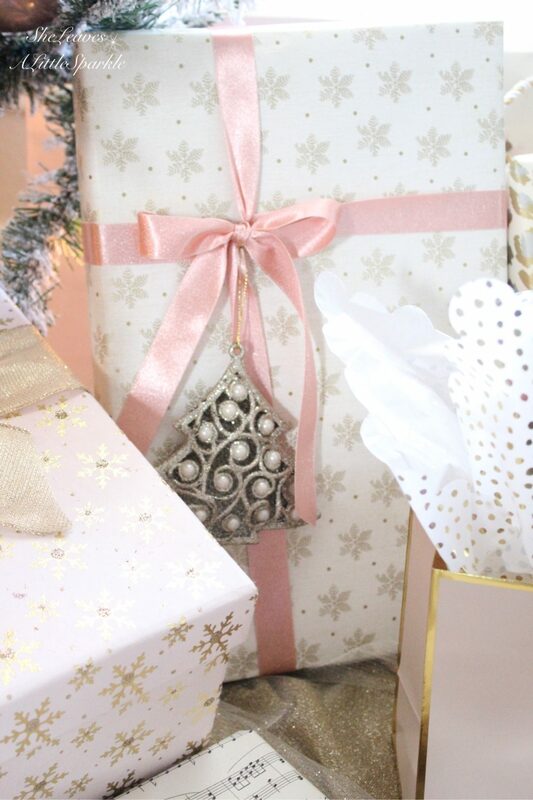 Anyone else loving the blush gift bags from Target this year? The boxes and wrapping paper were too peach for me. But then again, if I could find some, I might add some of it because I do love different shades. 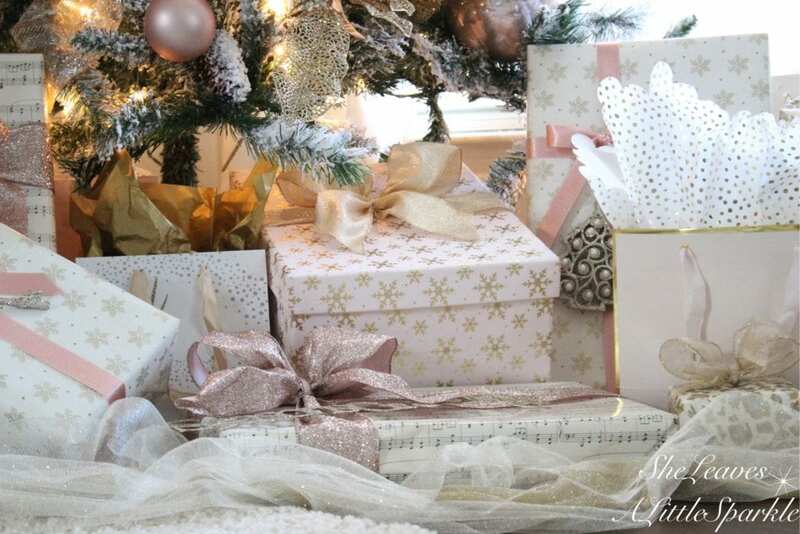 There are all different fun ways to wrap your gifts and keep things “interesting” under your tree. 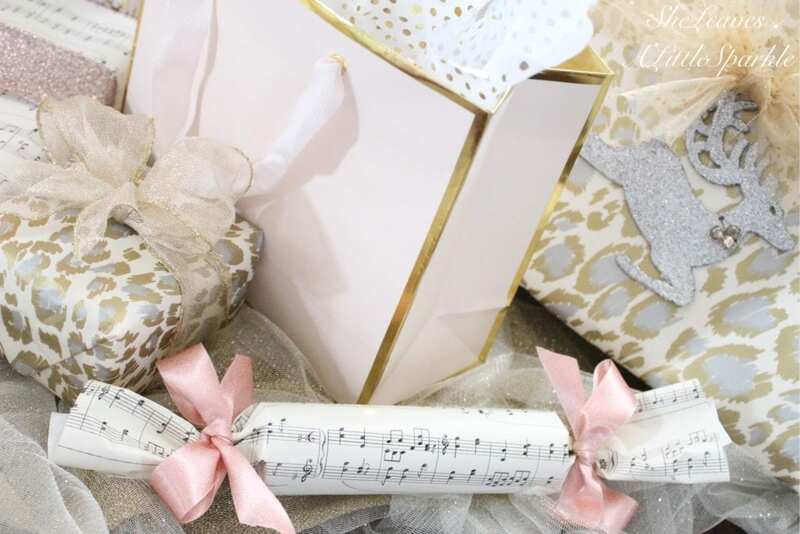 Also look for coordinating gift boxes at your local home decor stores. 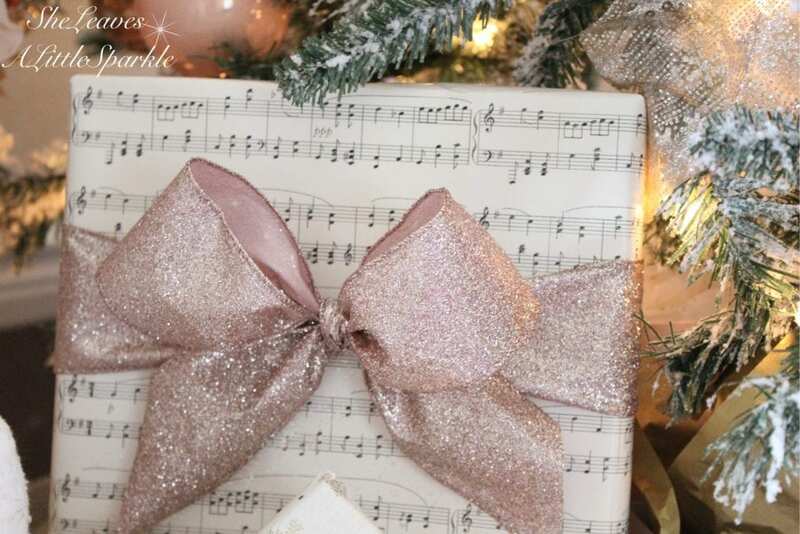 You can use those and just some ribbon and then won’t have to wrap….just tie a bow. 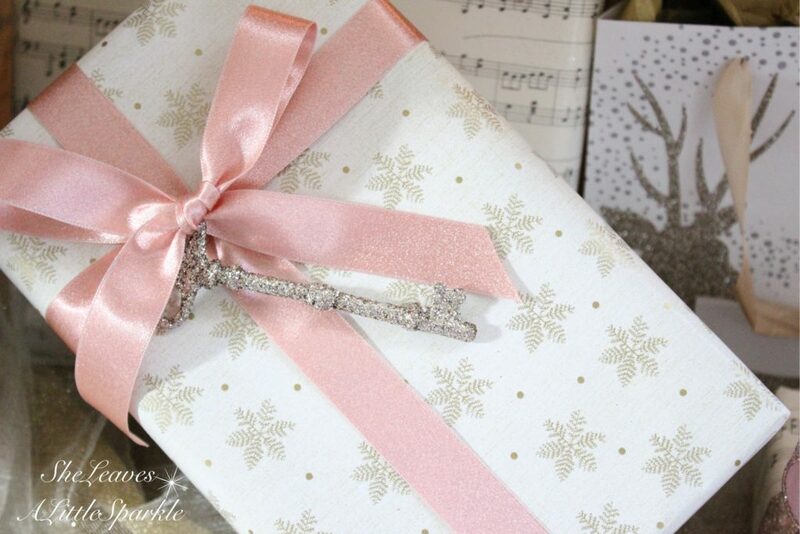 I just adore a glittery key! After buying all the blush-colored roses I could find at several Michael’s stores in my area….unfortunately, everyone else wanted them too and they are not restocking them. So I continued on with my mantel but left out the blush. I kept it white and gold and silver and champagne. 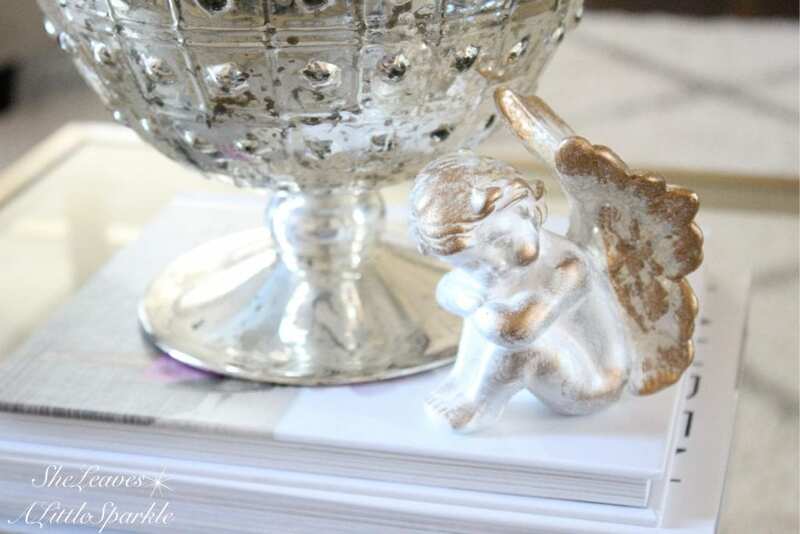 Almost every room in my home has an angel at Christmas. I love this one. She’s so elegant. I made that “Peace” banner a few years ago and I can’t believe it is still in good condition after several moves. 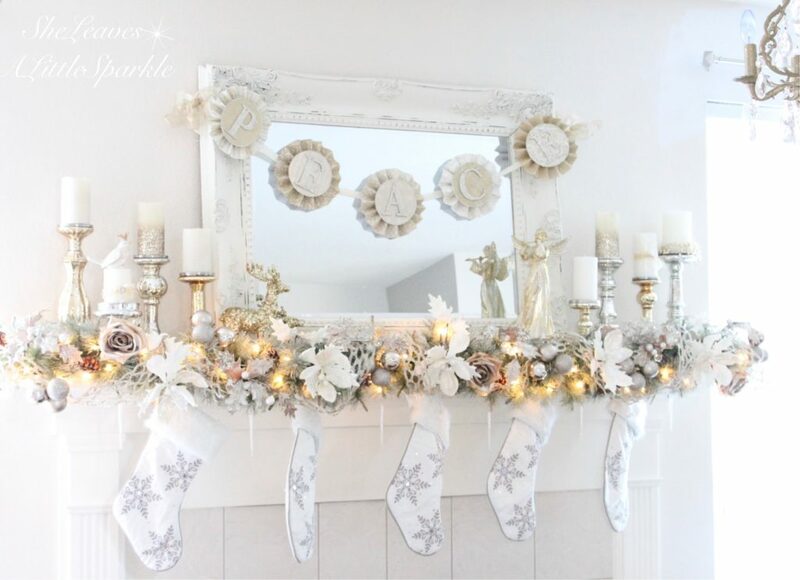 And of course, no mantel in my home would be complete without sparkly glitter candles. 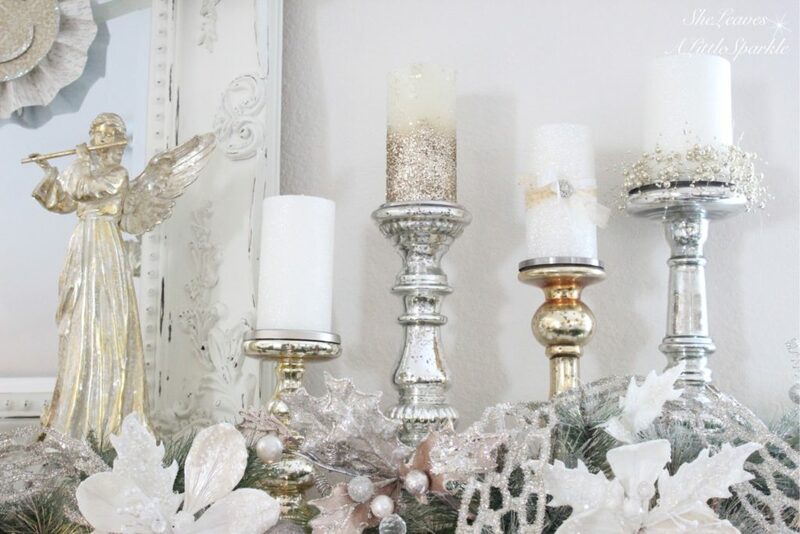 I stagger my candlesticks and mix metals to give it more appeal. I love the way it looks. I found some pretty gold roses at Michaels so I was so thrilled about that. They look lovely, bunched in with champagne foliage stems from Decorators Warehouse. 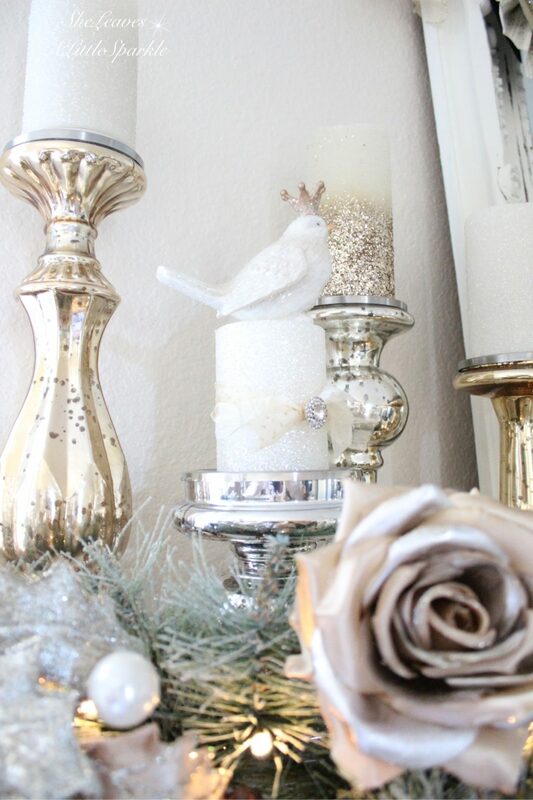 I love adding sparkly birds as well throughout my Christmas scenes. This pretty little guy was a recent gift from my mom. She knows my affection for these little birds. 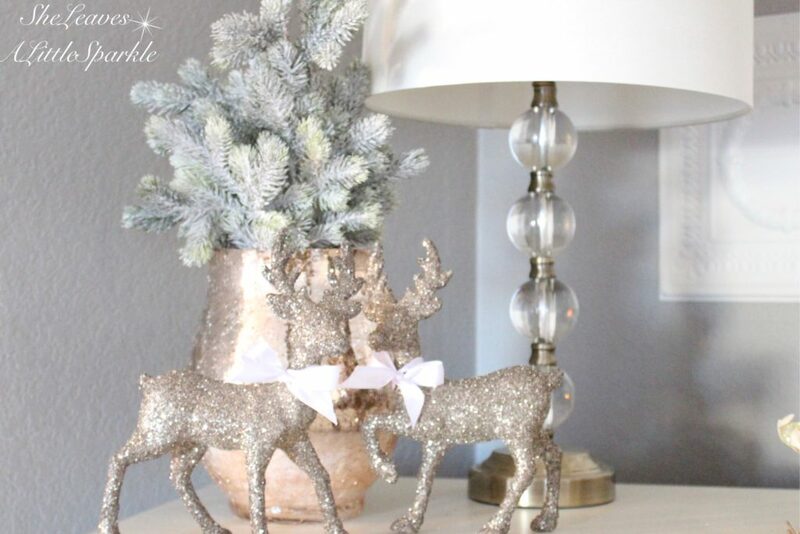 Using glitter deer and other pretty candlesticks, candles, and garland I have leftover, it’s easy to spread them out throughout the room and create lovely vignettes. Ok, so this room has 2 angels! 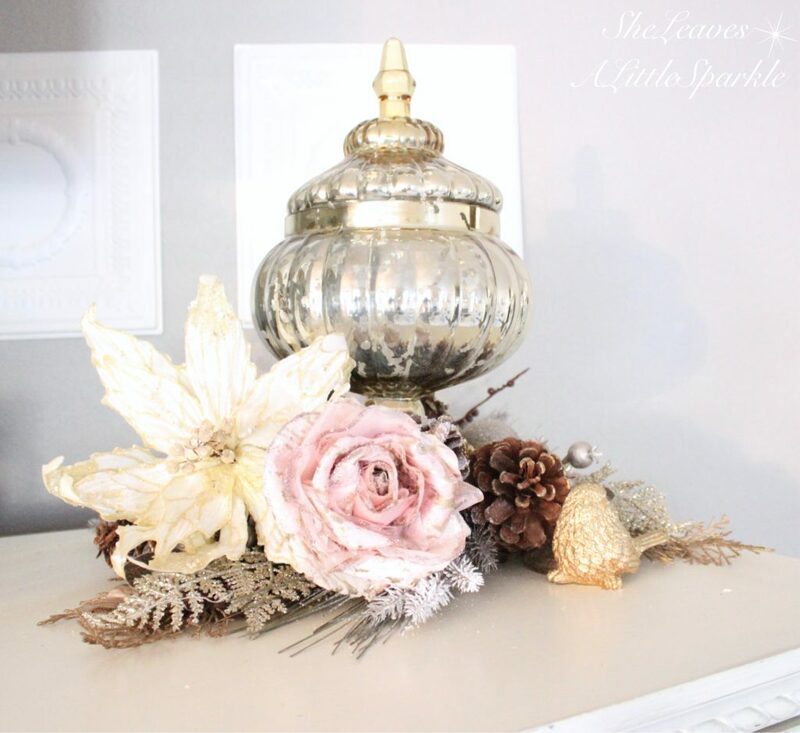 A fun way to add some festive Christmas decor is to take a pretty bowl, apothecary jar, or dish and place a variety of sparkly ornaments inside. They can be some of your favorites or even some from the dollar store. This is my favorite Nativity Scene. It was just a few dollars at a garage sale in Waco 5 years ago and exactly what I was looking for. 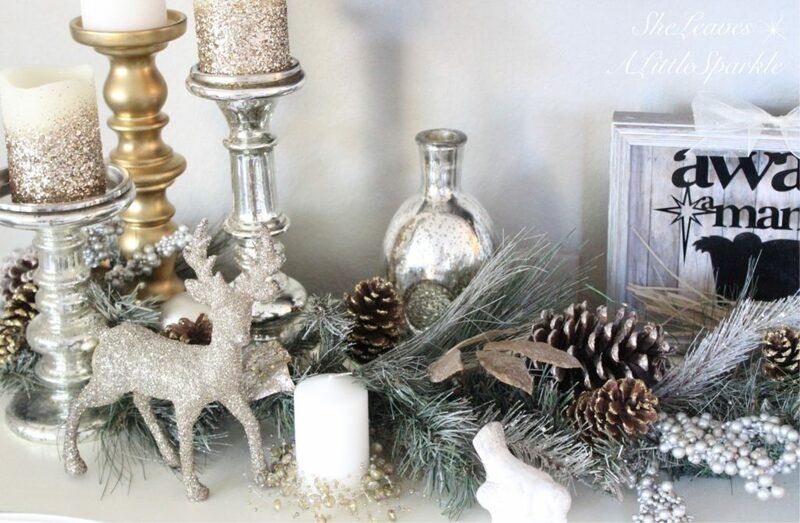 Think of the details in the room….make sure to add a touch of Christmas to your shelves and tables. 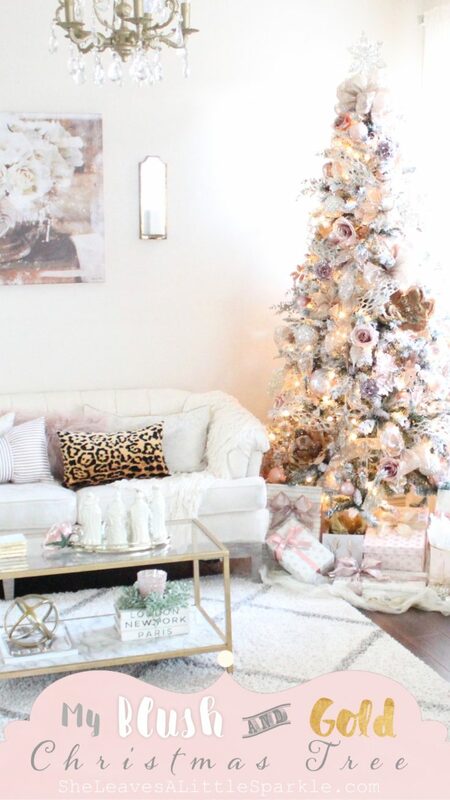 And there you have it…my living room all decorated for Christmas! 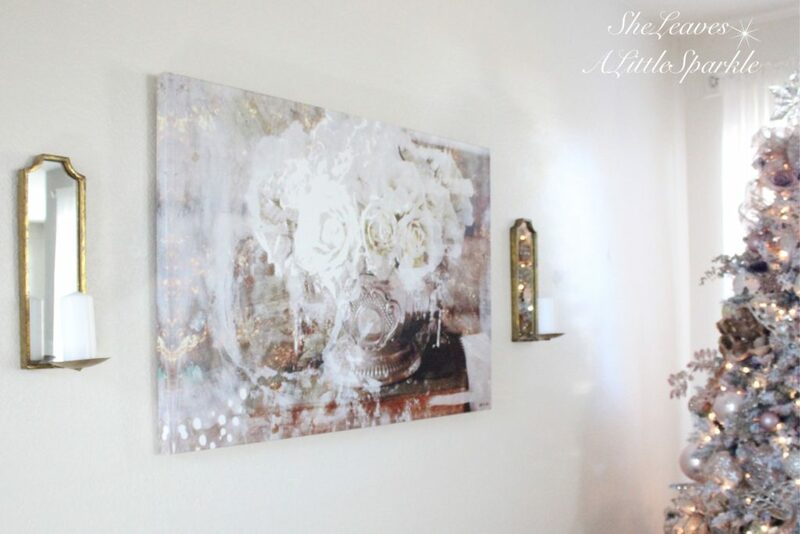 To help you find the sources I used for this room, I am sharing my shopping links below for your convenience. If I don’t have the exact source, I may be attaching once similar. 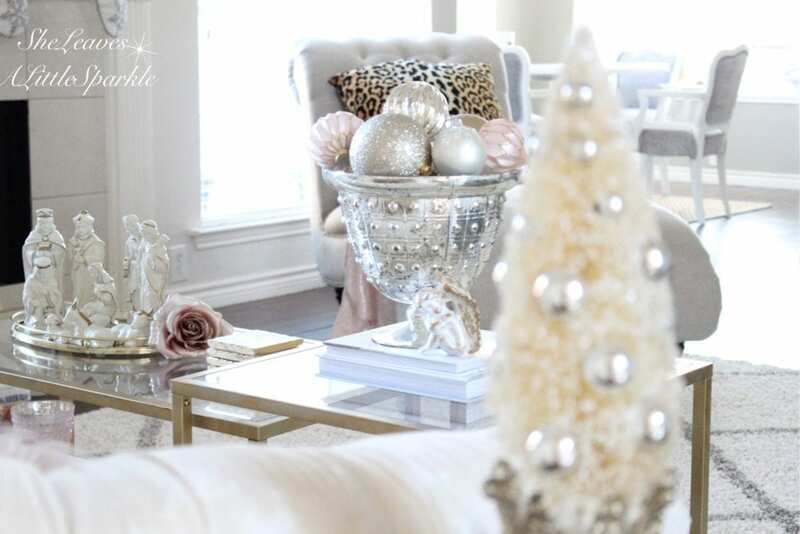 I’m so glad you could join me today for my Holiday Living Room Tour! I invite you to follow me on Instagram, Facebook and even Pinterest to see what I’m doing next. I’d love it if you subscribed to my email list at the top of the page to get my weekly news of the latest posts and even sale alerts to my shoppe. 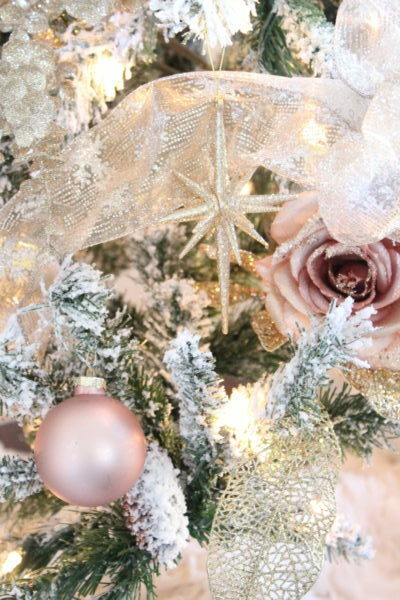 Please make sure to visit my other friends joining me today and visit their Holiday Living Room Tours for more inspiration. 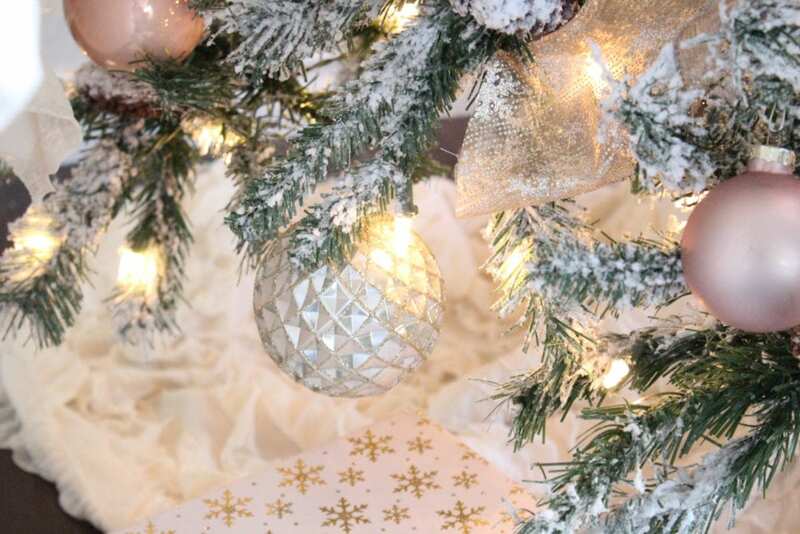 Wishing you the Merriest Christmas season! Summer!!! This is gorgeous! 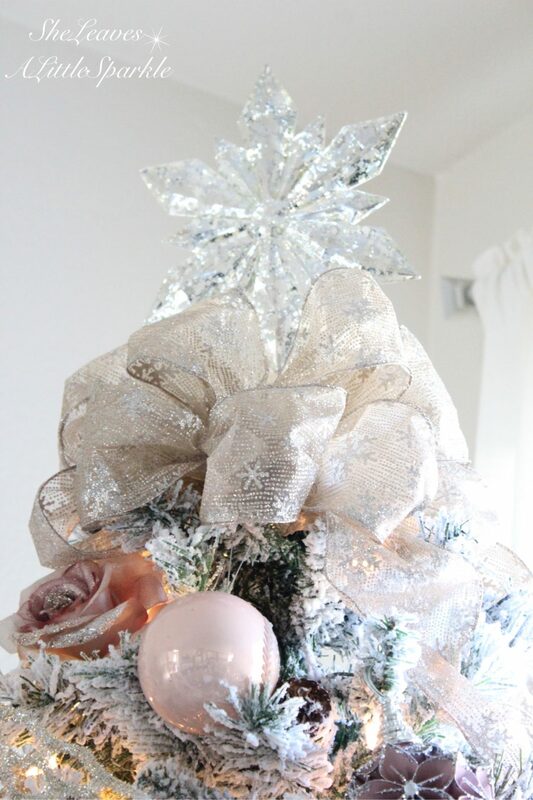 I love every single detail and the blush touches are my favorite! 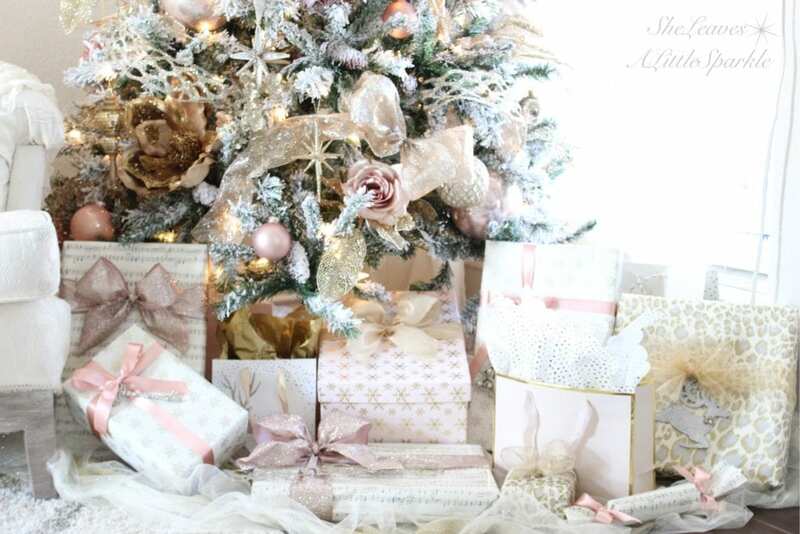 I hope you have a beautiful holiday with your family! That means so much, thank you Alicia! 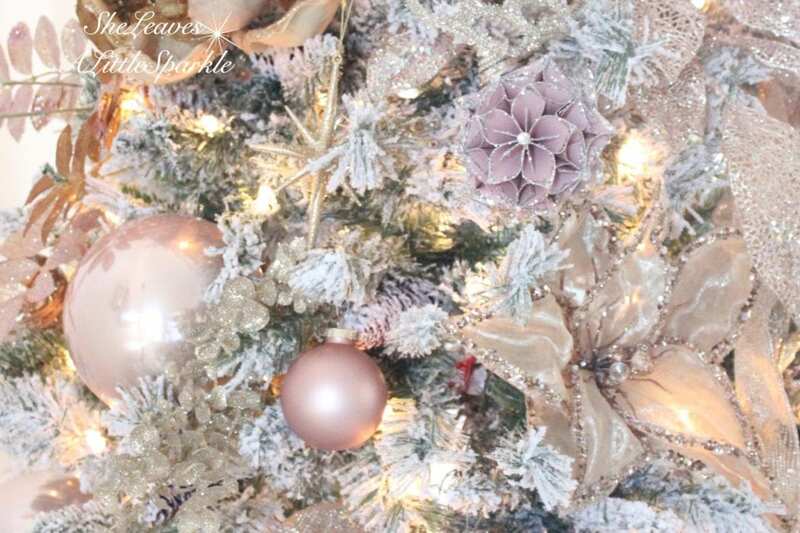 Wishing you a wonderful Christmas season as well! Running over to your blog now! That tree!! Those colors, the roses…just beautiful!! Gorgeous room! That is so so sweet, thank you Amy! Can’t wait to go check out your living room! Thank you, Sandra! Isn’t it funny how we do that?! 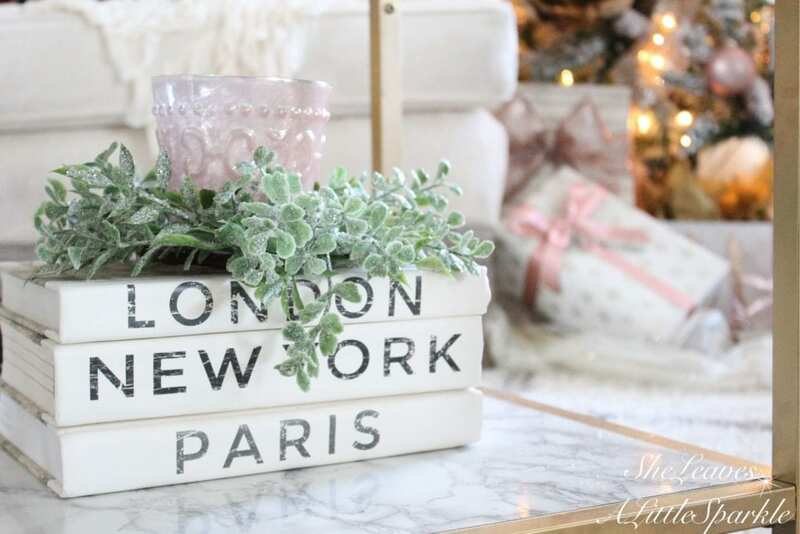 I tried going a little more farmhouse style a couple of years ago but it wasn’t me and I knew I was a glam, girly girl. So I came back haha. But I still love it! All styles. I like to dabble and try it all out. I think that’s the best way to find your style and see what speaks to you. I find that I am pretty eclectic and mix styles a lot. Very pretty. 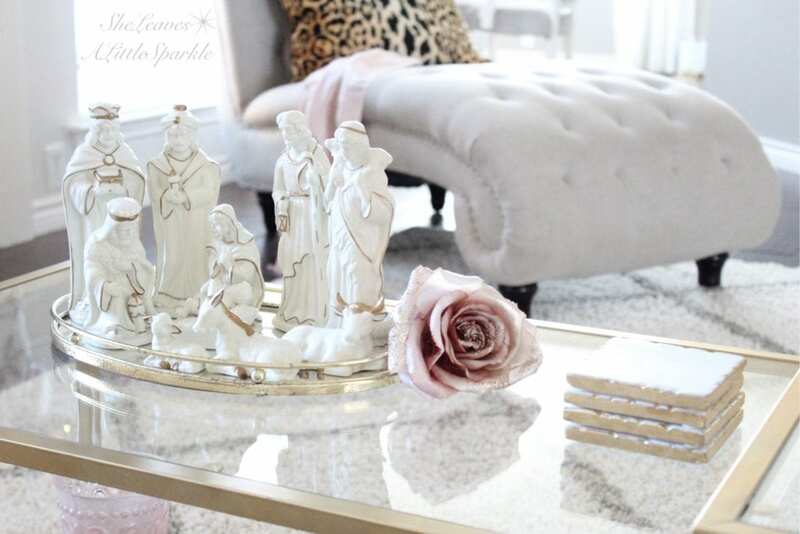 Where did you find the small white nativity set? I found a white set at Kohls but love the small version. Thanks. Hi Lisa! I found it at a garage sale for just a few dollars when we lived in Waco Texas. Isn’t it precious? I linked some other ones similar at the bottom of the post that were reasonably priced. Would one of those work for you? Summer, it is absolutely amazing!!! Every detail! My blush tree in my office is going live Friday. 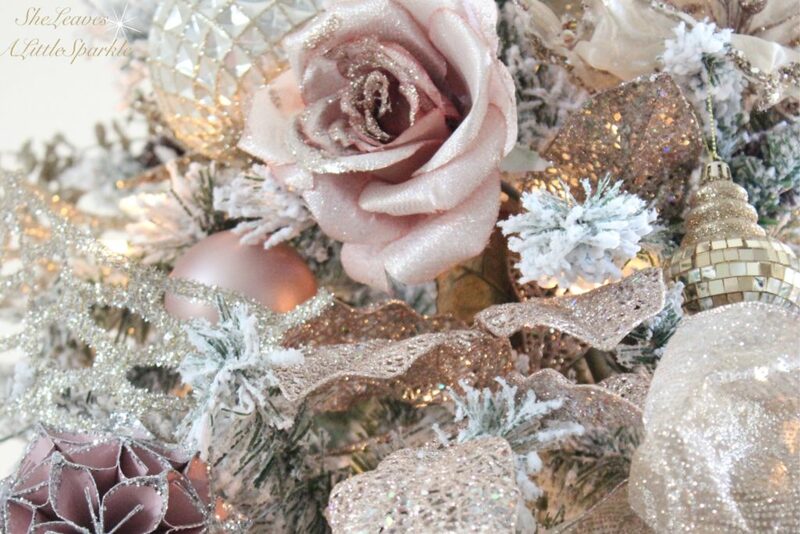 Michaels ROCKED the blush this year! And you rocked your living room! Stunning. Oh my goodness GIRL! That tree?!?! I love what you did…so Glam!! Your tree is just stunning. I love the soft color palette you used. 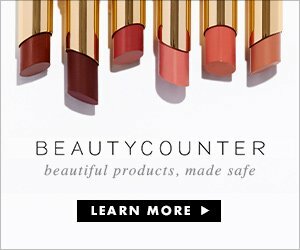 Your home is truly beautiful! All so gorgeous! Love the flowers! This tour just takes the cake. I’m also doing blush, gold, and rose gold. I love this color palette. It’s so soft and romantic feeling. So easy to find packages and wrapping paper and it can be used year round. I have heard from several people that the Christmas store in Texas is amazing. I don’t have any stores like that in my area so keep inspiring us with those great finds and ideas. Gushing over everything!! Especially the leopard! Knocked it out of the park, Summer! The traditional red and green combo is not my thing, so I love seeing how others interpret holiday decorating with colors outside of that scheme. 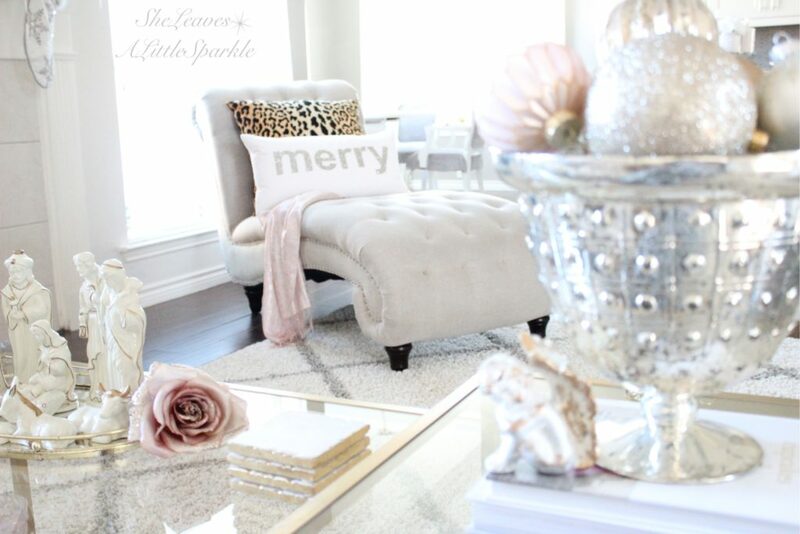 What a happy, bright, sparkle-filled space. Great idea to pepper in my leopard velvet pillow covers to balance out all that sweetness just a little bit. Happy holidays, Summer! I feel the same way! Thanks soooo much, Hollie!! 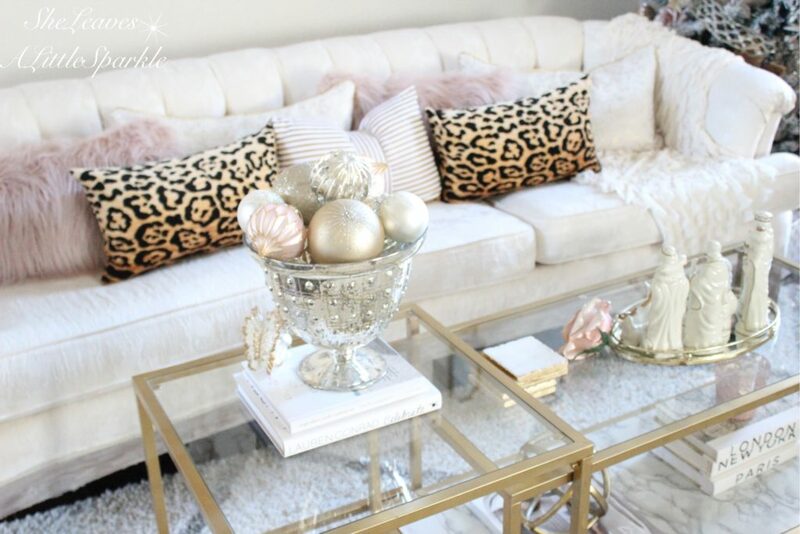 These leopard pillows are FABULOUS and everyone’s loving them! ☺️😘😘 Merry Christmas! Where did you buy that tree topper? Its gorgeous!